Most two-part varnishes don’t fit the bill—at least not entirely. Compared to other wood coatings, most are neither easy to apply nor easy to maintain. However, they do last for several seasons, and price wise, they are on par with other wood coatings. Their appeal is generally durability and the glossy, wet look they have when applied properly. “The Look” is that beautiful, clear mirror-like finish. 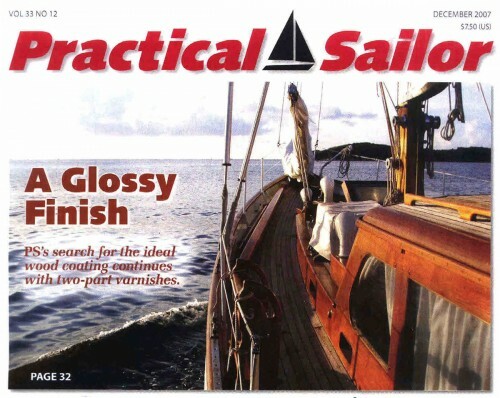 For some this aesthetic value, coupled with the luxury of not having to reapply the finish for several seasons, is worth the extra time, energy, and attention that applying a typical two-part varnish requires. And it is for those brightwork slaves among us that we have included five two-part varnishes in our exterior wood coatings test— plus we’re curious to see just how well they fare when compared to one-part varnishes, synthetics, and stains under the same conditions. Are they really more durable? Do they protect better than other coatings? Is the difference worth the pains of application— and just as importantly, re-application? This is the third installment of an ongoing report on our exterior wood coatings test, which began with an introduction to one-part varnishes (August 2007), followed by our synthetics and stains review (October 2007). Still to come is PS’s report on teak oils we’re testing. With more than 50 products to compare, PS opted to split the products into categories, so the information is a bit easier to digest. However, all of the test panels have been mounted and will face the same conditions in our longterm durability test, (see “How We Tested,” page 33), and all will be monitored regularly. The focus of this exterior wood coating test is to evaluate three things: a product’s ease of application; the integrity of its gloss and appearance; and how it fares under real world conditions. The two-part varnishes were applied in the exact same manner as the other wood coatings being tested. Each two-part product was applied to a 2 x 5-inch teal panel cut from the same bare teak. Each product and each panel were assigned a number so that judging could be done blindly. The panels were prepared and the coatings applied per manufacturers’ instructions. Three PS testers rated the gloss of each panel by its shine and reflective qualities. Ease-of-application ratings were based on how smoothly the product went on, how complete the instructions were, and how simple the process was. The next step was to mouth the panels on a rack with the one-part varnishes, synthetics, and stains that we’ve reported on this year. A portion of each panel is covered, so testers will have a control to compare weathered and protected finishes over time. Once all the panels are mounted on the rack, it will be set up at a 45-degree ante on an unobstructed roof. We will monitor the panels regularly and publish updates to let you know how well they’re holding up. The rack: The exterior wood coatings that we’re testing will all be mounted, and the rack will be left to weather South Florida’s heat, humidity, rain, and occasional chill. PS tested five two-part varnishes for the exterior coatings showdown: Bristol Finish Traditional Amber, Smith & Co’s Five year Clear, HMG Paint’s Acrythane XCS, Interlux’s Perfection, and Bonstone’s Nautiking Nautithane. Of those, the Bristol and Smith & Co. are returning contestants from our 2003-2005 Teak Treatments All-Stars face-off (finale, Feb. 15, 2005). However, Bristol changed its formula in March 2003, so the product we are testing now is not the same as the Bristol in the previous test. According to its makers, the new formula has increased durability, a slower dry time for brush ability, and a faster cure time. C-Tech Marine, the maker of Bristol Finish, offers three application methods to choose from: the wet-on-wet method, dry method, and the practical method. We used (surprise) the practical method (see chart for specifics) which entailed very little sanding, making Bristol the easiest of the two-parts to apply. HMG Paints, a European company with a branch in the U.S., produces a number of wood coatings, including its Acrythane XSC. This polyurethane didn’t flow evenly at first, the finish was smooth and even. Perfection, from coatings giant Interlux, is a linear polyester. Our Perfection test panel had the best initial gloss of the two-parts. To maintain this top gloss, Interlux recommends sanding the finish with a maroon Scotch-Brite pad and applying a fresh coat at regular intervals. Nautiking NautiThane, a new coating by adhesives makes Bonstone, was the fastest drying of the test group. Smith did tell us that he recommends a dry film thickness (DFT), measured with a micrometer, of 10 mils. In comparison, Interlux recommends a DFT of 6-8.5 mils, which can be achieved with five to seven coats of the Perfection. Along with the how-to’s of varnish application, the use of two-part varnishes always draw a debate among boaters. Are they worth the effort of aren’t they? The answer largely depends on your taste in finish, your approach to boat maintenance, your patience level, your deftness with a brush, and your tolerance for a heat gun and scraper. Two-parters come with a bevy of contradictions. It seems for every pro there is a con: They offer a tougher, more abrasion-resistant finish than other flavors of wood coatings, but this hard finish is difficult to sand for touch-ups without leaving ghastly scratches in the finish. They provide a good moisture barrier for sod, but this can lead to blistering when water migrates upwards through fastener holes. Most dry fast, shortening the recoat wait, but that quick-dry feature also means you better brush on quickly or risk brush marks in the finish. They are durable and, with regular attention, can last for several seasons. However, once the varnish goes south, break out the scraper and heat gun, because you’ll never get it off with sandpaper. Ahhh, but then there’s that beautiful, durable shine. Well that same clear gloss will highlight each and every imperfection in the prep work as well as any runs, holidays, or other application boo-boos. So, don’t rush the job, any hiccup will haunt you later: but don’t be too slow, you’re on a timer as all two-parts have a set potlife. Another two-part related topic that incites opinionated discussion is wether or not using epoxy as a base coat is a good idea. One product we tested, Snith & Co.’s Five-Year Clear, instructed us to do just that. We applied three coats of Smiths Clear Penetrating Epoxy Sealer on bare wood and then the two-part varnish. The result was the appearance of a thicker (deeper) layer of varnish than other test products offer using about the same number of coats. Interlux’s Jim Seidel, a veteran of the coatings industry, is also a fan of epoxy build-up coats (using Epiglass, West Systems. Smith’s, etc…) He suggests thinning the first epoxy coat to ensure penetration into the wood. While epoxy adds durability and makes buildup faster, it does not have any UV protection, so applying varnish over it is a must. So how do the pros and cons weigh out? Differently for each boat owner. Evaluating your needs and your priorities will help you decide whether a two-part product is right for your boat. If you’re not too handy with a brush—or a heat gun and scraper— then we suggest staying away from clear two-part varnishes. However, if you want a hard finish for your toe rail and like to admire your reflection in your handiwork, then by all means, break out the mixing cups and a good brush. All the of the good two-parts we tested rated Good or better in both gloss and application (when compared to each other, not other varieties of exterior coatings). Our top pick among two-parts, so far, is the Bristol Finish as it was the easiest to apply and had Excellent gloss. The Smith had Excellent gloss and went on nicely, but it’s time-consuming application and single-source supply holds it back. The Perfection also passed muster among our testers. The cheapest per quart is NautiThane, and the cheapest kit is the Acrythane. Stay tuned to see just how well these products protect wood for the long haul.